We’re supposed to be in India now. For months, we had planned going on a backpacking trip from Nepal to India to Sri Lanka. 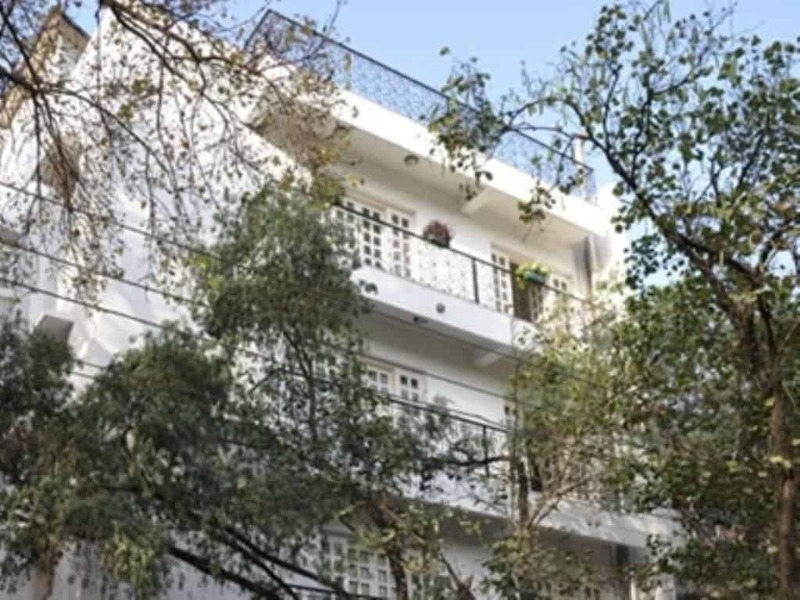 We had almost everything taken care of including our hotels and an India visa. But something personal came up so we had to cancel the whole thing. I’m still a little bit bummed, but I guess some things are really just out of our control. The good news is, because I have tried applying for an India visa, I can now write about the experience. I was actually quite surprised to learn that we needed a pre-issued visa to enter India. Filipinos used to be able to avail of visa-on-arrival, but that had been discontinued a couple of years ago. 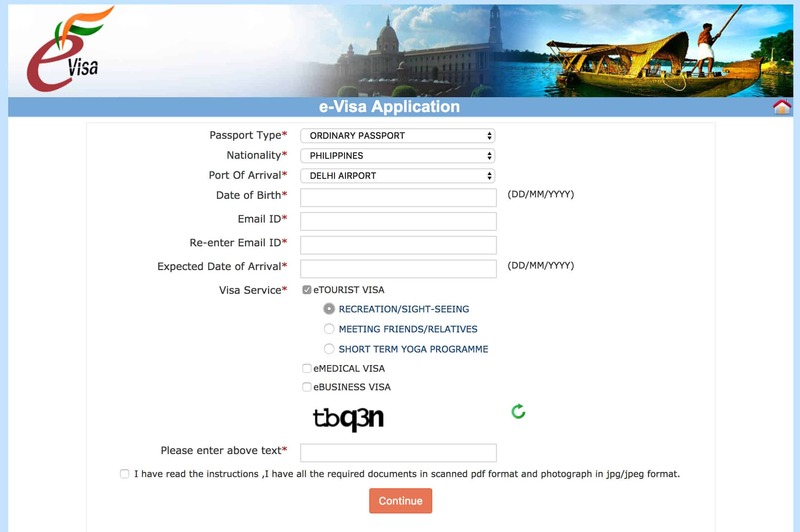 Today, Philippine nationals visiting India may apply for an e-Tourist visa, e-Business Visa, or e-Medical visa. 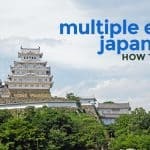 In this post, we’ll be focusing on the e-Tourist Visa only. It’s actually pretty easy. I finished my application in an hour and got my visa the next day. Here’s how to do it. 1. Make sure you’re eligible for an e-Visa. 4. Settle the visa fee. 6. Confirm that your visa is granted. But first, here are the requirements. Scanned copy of the your passport’s bio page. Your passport should have at least 6 months validity and at least 2 blank pages from the date of arrival in India. Recent photo. Front facing and against a white background. Visa Fee, which costs USD 50 + USD 1.75 bank transaction fee. So that’s a total of $51.75. You can pay via credit card or PayPal. Update: According to some of our readers, the visa fee is now USD80. They paid a total of USD82.35, including transaction charge. Apply for an e-visa if at least 4 days in advance of the arrival date with a window of 120 days. The Embassy site gives this example: If you are applying on September 1 then you can select arrival date from September 5 to January 2. Your sole objective in India is recreation (tour, sightseeing), visit friends or relatives, or casual business visit. 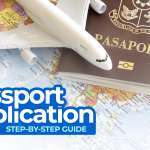 Your passport must have at least 6 months validity from your arrival date. It must also have at least two blank pages. You must have a return ticket or an onward journey ticket and enough money to spend during your stay. It is also accepted at the following seaports: Cochin, Goa, Mangalore. 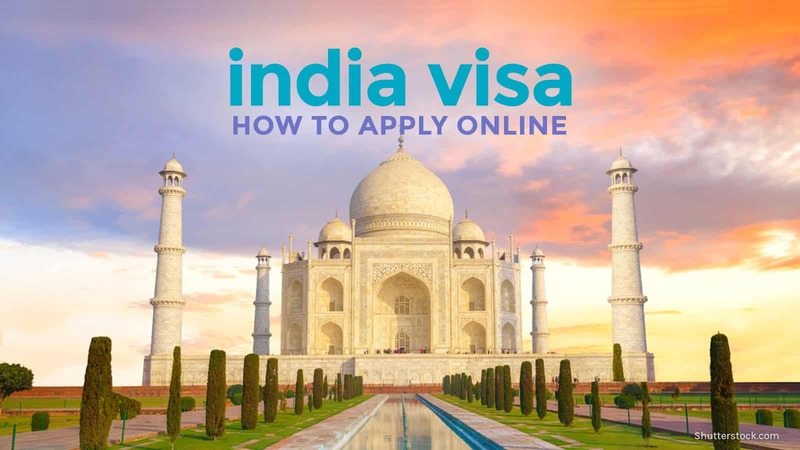 If you’re planning to enter India through another gateway, you will have to get a visa the old-school way. Apply at the Embassy. In that case, I won’t be able to help because I haven’t tried that one. I enumerated the requirements above, but just in case you missed it, here’s the list again. Scanned copy of the your passport’s bio page. Fee, which costs USD 50 + USD 1.75 bank transaction fee. So that’s a total of $51.75. You can pay via credit card or PayPal. That’s it.  Now all you need to do is apply and pay online. Go to India’s e-Visa Application Page. 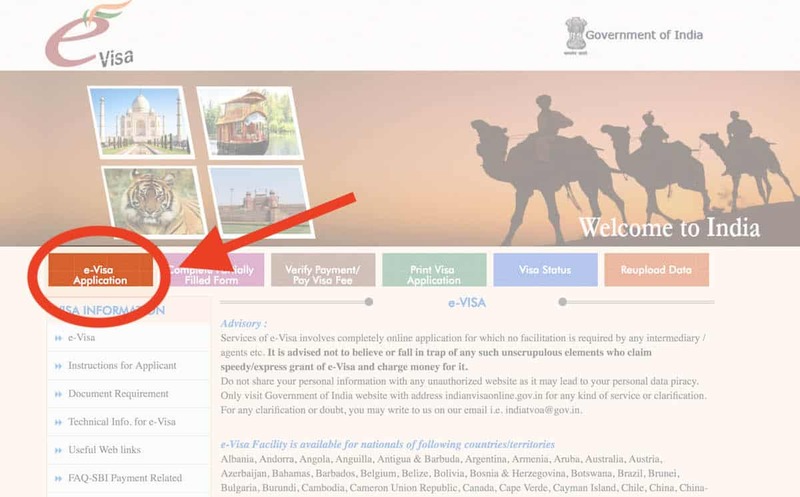 Click on e-Visa Application on the top menu. See screenshots below for reference. Accomplish the short form. 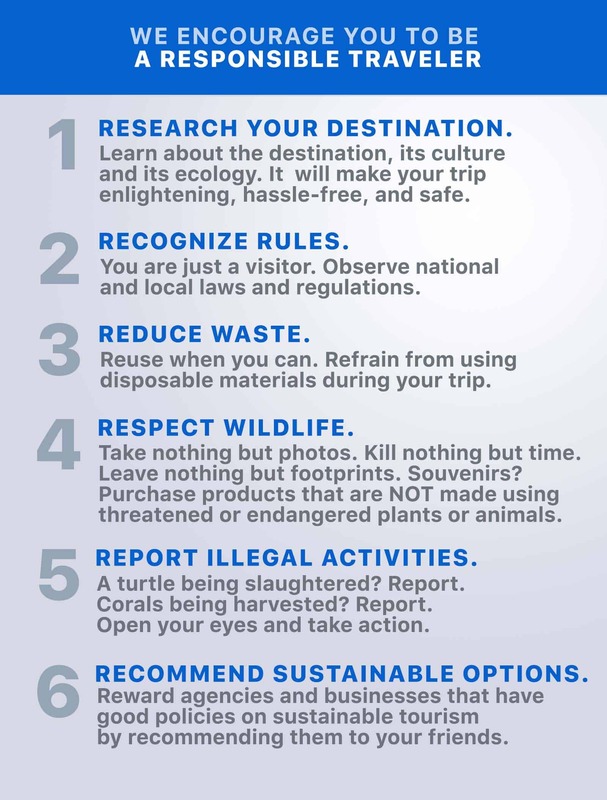 Don’t forget to tick e-Tourist Visa, and then choose Recreation/Sightseeing. Once you’re done. Click Continue. On the next page, fill out the form. You will be asked for your Personal Details, Family Details, Employment Details, and the details of your trip. It’s pretty straightforward. The only thing that confused me a little bit was the part that asked for References in India. If you’re not visiting anyone, you only need to enter your hotel, its address, and contact number. You will also be asked for your reference in the Philippines.  On the next page, upload your photo and a scan of your passport’s bio page. Important! There are a lot of impostor websites that pretend to be the official India E-Visa portal. It’s uncanny. They look official. But these are scams. They will charge you more than triple the real cost of the visa. Don’t fall for them. Make sure you visit the right website, which is www.indianvisaonline.gov.in. You will be asked whether you want to pay via SBI or Axis. 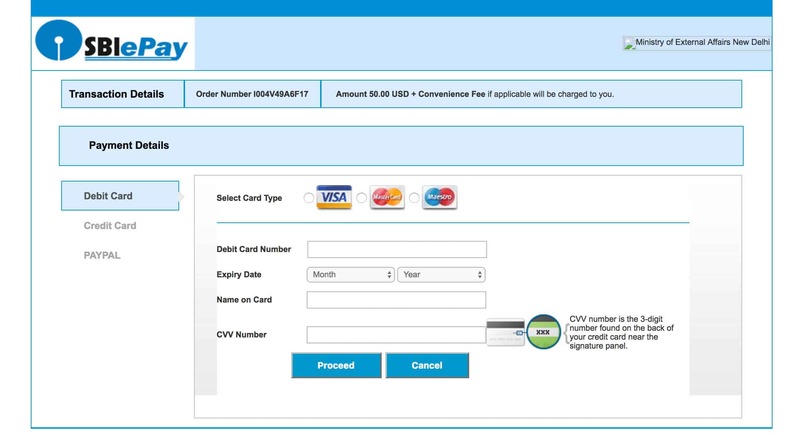 These are payment gateways. SBI stands for State Bank of India. I chose SBI. Then you will be asked if you want to pay via PayPal, debit card, or credit card. For Credit Card, Visa and MasterCard are accepted. For Debit Card, Visa, Mastercard and Maestro are accepted. The fee is USD 50 + USD 1.75 bank transaction charge. Total of $51.75. That’s it! After that, the waiting game begins. What you’re actually waiting for is an email from them containing your Electronic Travel Authorization (ETA). Here’s what it looks like. Normally, it takes 72 hours. But I finished my application on May 17 at 4pm and received my visa at 9am the next day. That was super quick. 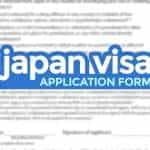 The visa is double-entry and valid for 60 days! The visa can also be used within 120 days of issuance. This means that even though my trip was canceled, if I want to, I can still use it within the next four months. Hooray! Before your journey, you have to double-check that the status of your visa is GRANTED. To do that, enter your Application ID and Passport Number on this page: India Visa Status. If everything looks fine, you’re good to go! If not, contact the e-Visa Support Center by sending an email to indiatvoa@gov.in. Hi, thanks for this info. This has been the most informative i have read on applying for indian tourist visa. Would just like to clarify about the 60 days validity. 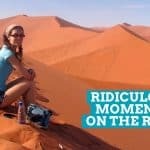 Does this mean you can stay in india for 60 days straight? Without exiting and re-entering? Coz i am planning to stay in india for 1.5 months and most of the information i see online is that only 30 days is given to filipino tourist. Hope you could accomodate my query. Thank you in advance. Hi Chit! Yep, the visa given to me would have allowed me to stay in India for 60 days. Not sure if that’s the case for everyone. They will only ask if questionable yung employment status mo or may nasense silang dubious. Normally, the visa, return flight, and ID should suffice. Okay lang naman yun. They ask for employment details though, so if you’re employed, I think it would still be alright. Is your boyfriend Indian national? If yes, mas magiging problem mo ang Immigration sa Pilipinas kesa visa. Hi my girl friend is filipino and she is coming to india..how much sufficient money to show for indian tourist visa on arrival for 15 dayss?? Tanong lang po, ilan po ba ang kailangang show money pag less than 1 week lang na travel sa india? Bibisitahin ko lang sana boyfriend ko dun. Hindi po sya indian pero sa india sya nag work.. If you have an ATM account or credit card, dalhin mo na rin ung cards, makakatulong un pag tinanong ka ng Immigration. I got tickets to Jaipur (via SG) this July. HI! I am planning to apply for an Indian visa the soonest. May I know which or what particular airport or the nearest to take if I’m heading to Agra? Thank you. Yung covered by eVisa? Delhi yung alam ko. Agra has its own airport though. 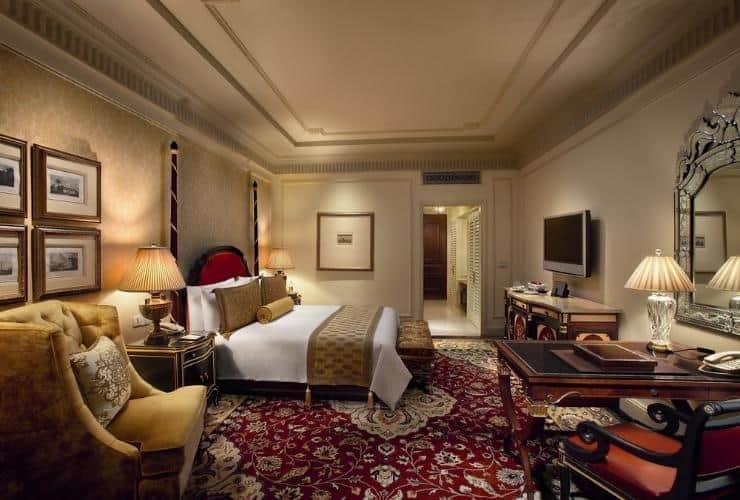 Delhi is the nearest airport near to agra , and its better also , first tour delhi then you can go to agra , dont visit agra on friday because Taj mahal is closed for visitiors on friday . H jen. U said u guys r planning to get married.. if u inform the same way sa immigration they will ask u to provide a sample of your india wedding card/ invitation. Its also better for u to secure first your certificate of no marriage (cenomar) from the philippines since u will be needing it once u register the marriage in india. The cfo certificate u can apply for it only in philippines, they have 2 branches only, one in manila and the other one in cebu city and u need to attend a one day seminar for it. In case u have the wedding done in india, u can have the seminar later on once u come back in philippines. They are going to keep a sticker in ur passport and a certificate from cfo. Without these, u wont be able to travel back to india pag married na ang status mo and u had ur family name changed. Feel free to contact me thru my email if u need more information. Hello. This post is very helpful. I plan to visit India by November this year to meet up some Indian friends. They are willing to host me on my two-week stay there. 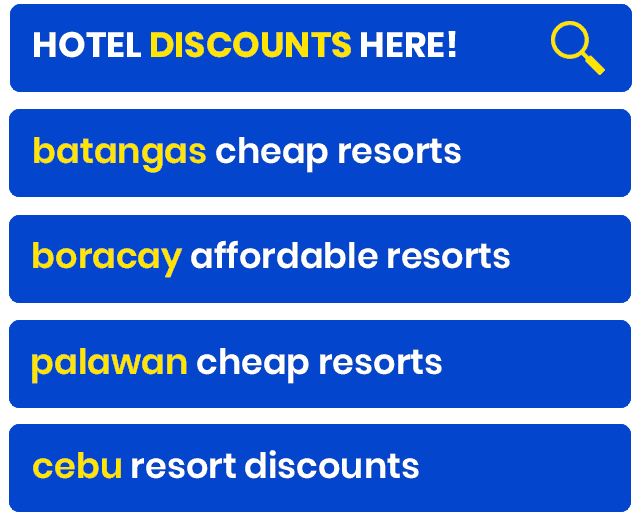 Yet I’m ambivalent on how much my bank account should have and about providing to the Philippine Immigration on hotel bookings. Can you help me with this? Looking forward to your response. Thanks. Hi jack, I have no idea on the bank account. They don’t explicitly say. As for hotel bookings, hmmm, if you’ll be hosted by your friends, you can just say that you’ll be hosted by your friends and have an invitation letter and other proof of relationship. This is so informative and helpful! A million thanks to you!!! I used it as my guide and so easy to follow! She said it exactly and I perfectly did it. I received mine so fast. Get pack and ready to go!! We have planned our wedding in india.. and will be staying in india for 3 months approx. Can some one please guide me through the process how to go about this application and how much time would it take for the approval. How much should i pay in e.visa? hello sir good morning…sir tanung ko Lang kailangan ko kc ng visa 6months pataas…anong visa po ba ang available? I paid 82.35 usd in total or Php4,496.09. Ay, biglang tumalon, haha. Oo, last year lang ako. I-note ko sa post sa taas na nag-increase na ung fee. Salamat for letting me know! hi do you have an idea why am I getting an error message ” your payment has not been received”. I used mastercard. Hi Seth, naku, sorry, no idea. Best to call your bank. Hello! 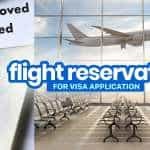 Have you heard about anyone getting declined on visa application to India or is it very rare? After reading blogs, I think the e-visa application is safer than risking on getting visa upon arrival. Hi! Thank you so much, your article has been a great help! However, I have one question. The port of entry for my evisa is different from the flight ticket I bought. Do I need to contact them and change it? I’ll be arriving in Jaipur instead of Mumbai. Hi Cammy, yeah, best to contact them to know if it’s okay. Hello.. Panu po kung di ko nagamit ung approved visa ko to india. May effect po ba yun sa next application ko? Hello..Saan po pede magbayad ng visa to Paypal? Not sure if I understood your question correctly. But the page will redirect you to Paypal automatically. Ilan attempt po ba pag bbayad ng visa ? Hi Bella, I dunno. I submitted a scanned copy eh so I wouldn’t know if tatanggapin nila ung photo. Ang visa is yung paper lang? .. hindi yung dinidikit sa passport? I want to visit Kashmir to visit my friend. 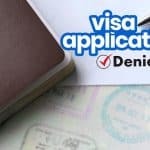 Can I apply for an Indian E-visa using the same procedure? Hi. Im a student do u think they will approve my visa? i have stable money on my bank account, my parents are sending me money monthly. My Friends will shoulder all my expenses there I am just worried if they will approve me…. Please help me with this. Thank you! Hi JJ, di ko pa alam. Depende po kasi yan sa maraming factors eh and sa kung sino ang magpoprocess. Wala naman kaming view sa ganun. 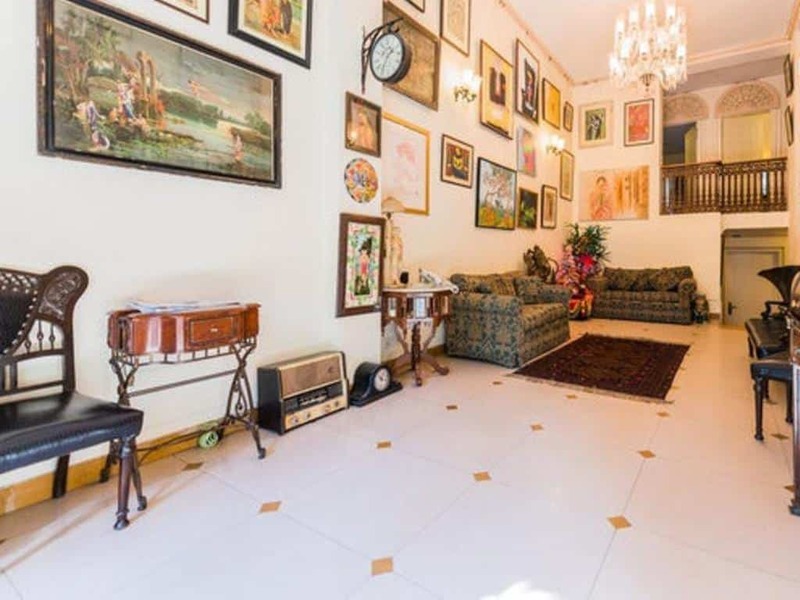 Hello po gusto ko po sana mg apply tourist visa sa india. Visit ko lng po parents ng bf ko.. Mkakasabay ko nmn po sya pag uwi.. Ok lng po b wla ako ma i show money? Wla p po ako bnk account.. Ok lng po b un? Plano ko po sana by april..
Yung visa, madali lang makuha. Pero baka mahirapan kayo sa immigration. Hi nagaaply po ako sa site for the e-visa pero for some reason hindi ma-upload yung picture ko. Ilang araw ko na po sya tinatry at lahat nung required for the photo nameet ko naman. But for some reason ayaw ma uploaf. May tips po ba kayo? Hmmmm. No idea what might be causing that. Do you get any error message? Im planning to arrive in new delhi then to kashmir india .. ano pa need ko na iba para sa kashmir india naman.?? hello! pano po we are trying to follow po the steps in processing kaya lng we cannot push thru payment nka ilang attempt na po kmi pero lagi sinasabi “due to technical reasons etc”nka twice attempt na po kmi pero laging failed. what to do po? thank you..
Hi Glenna, best to contact them directly kasi baka nga may technical issues ang website nila now. Wala din naman ako magagawa about it. Hello. Just wanna ask po, it says here sa article na 51.75 USD ang bayad, but after doing the process 80USD ang babayaran, maybe may mga changes na rin sa fees? at kunwari po nakapagselect ka na po ng date of arrival, kaso hindi ka po makakatuloy instead sa susunod na week ka pa makakapunta, okay lang po ba yun? nagapply ka ng September 1, date of arrival:september 6, pero di ka po makakarating dun ng september 6 kundi september 13… okay lang po ba yun? may show money po ba? Maraming salamat po. Hi Erika, mukhang nagtaas na nga sila. Dun sa hindi masusunod ung unang sinelect, okay lang naman kasi 6 months ung validity ng visa. Meron po bang “show money”? Like other countries na kailangan…baka kasi meron, bigla akong pauwiin. tanong po ulit, paano po kung nag apply ka online, tapos, di ka nakapagbayad agad, or di ka nakapagbayad 4 days before your indicated date of arrival, ano po mangyayari? ano po dapat gawin? Hi Erika, kung di ka nakapagbayad, ang alam ko, di confirmed yun, so hindi nila yun ipoprocess. Yun ang alam ko, di ko sure. That means po ba na pwede pa magbayad tapos iprocess nila? or kailangan ulitin yung process from filling and payment? Thanks a lot. Also, about sa show money… some of us naman pupunta lang dun for tour, bisita sa friends pero walang gaanong pera kasi may palibre sa kaibigan. May minimum amount po ba na dapat meron ka before ka nila payagan makapasok sa india? I tried to pay the e visa more than 10 times and sad to say it’s still failed. Wat to do?? Try using another card or use Paypal. Wala po bang show money, di na tatanungin sa immigration? return tickets and ID will do? First time to travel kaya baka hanapan? I really need ur advise. I’m planning to apply e visa this month and my Indian friend who lives there will sponsor me ,I HV no any financial proof like bank book or cards and I’m currently unemployed po. Gusto ko lang po sanang itanong kung OK lang po ba na financial proof ng sponsor ko ang ipapakita ko sa Immigration? First time ko po kasing mag travel abroad. Thanks po. Hi Vnza, sa immigration sa Pilipinas, medyo malabo. Malaki chance na ma-offload if wala kang proof of employment or income. HI.. I JUST WANT TO ASK, I APPLIED FOR AN EVISA BUT ON THE DATE OF ISSUE OF THE PASSPORT ITS NOT ACCEPTING THE DATE WRITTEN IN MY PASSPORT, IT KEPT ON SAYING IT SHOULD BE GREATER OF EQUAL TO THE DATE OF BIRTH, AND IT WONT GO ANY OTHER YEAR ASIDE FROM 2018. MY PASSPORT WAS ISSUED APRIL 16 2015 BUT WHEN I ENTER IT, ITS ALWAYS INVALID. I USED MY BIRTHDAY AND THE YEAR 2018 INSTEAD WOULD I HAVE PROBLEM WITH IT? Hi Sani, you might have a problem with it because the visa should reflect the details on your passport. Try contacting indiatvoa@gov.in to see if there is a way to correct it. 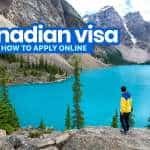 This is the best guide, about Indian e-Visa, I have read so far. I will read this again and again. hoho. I will be going to India on April 2019 so I am gathering information regarding Indian e-Visa. I will get back here once I have question. (wink) Thank you Yoshke Dimen. yung sa passport po ba, hindi na kailangan ng scan copy ng back part? and sa Photo, pwede 2×2? Hi Gillyn, if I remember correctly Bio page lang. And yep, parang 2×2 rin ung inupload ko. I am So happy that my e-visa is already granted!! Hi! Thank you for this post! this helped me a lot with my Indian visa application :) I actually just finished it *cross fingers* Anyway, after payment, it gave me the note that says “payment successful” and some thank you note for applying for indian visa etc. and it has application ID and passport number as blank. I’d like to keep the application ID sana just for record purposes and for follow up if I have to pero wala eh. Is it normal po ba na blank lang yun? Update mo kami kung ano ang mga magiging experience mo going to India. I will be glad to hear from you..
is it even an issue sa Philippine Immigration na wala kang Middle name sa eVisa? since it was not even asked during application? Ms. Doreen, I really need your response over this matter. Advance thank u for the both of you po. Hi Gillyn, di ko sure pero parang hindi naman issue. Kasi sa Australian e-visa and Turkish e-visa, wala ring middle name pero never naman ako nagka-issue. Hello! 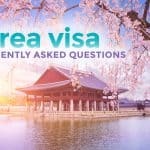 Do I need confirmed hotel booking before applying an e-visa? Thanks! Hi Janice, in my experience, no. Hi! Ask ko lang about filling-up ng online application form, yung sa Given Name, no need na ba na i-include yung middle name dun? kasi sa ibang blogs merong sinasabing ilagay din yung middle name after ng given name. Just want to be sure. Salamat in advance. Hi Panila, di ko na matandaan. But I think di ko sinama yung middle name. So yes, i did not put my middle name, just the given name. Thanks again! 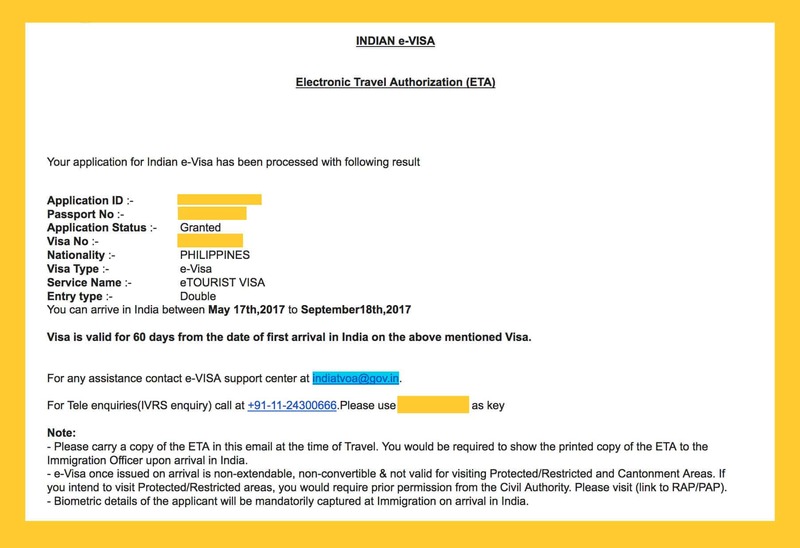 hi, thanks to this blog i was able to get my e-visa easily, i applied on Dec 20, 2018 at around 9am then i got my e-visa just after 12 hours, its GRANTED! thank you very much…. You mean proof that you can support the trip? Sa visa application, di needed yun. Pero may chance na tanungin sa Immigration so best to be prepared with it along with return ticket. Ibig sabihin ba if expected arrival date ko ay February 26, dapat sa Feb. 22 na ako mag-process ng e-visa? Hi Janice, no, it’s not like that. AT LEAST 4 days in advance. Emphasis sa AT LEAST. If February 26 ang target travel date mo, you can apply for a visa any time between 120 days before that and Feb 22. Latest na pwede kang mag-apply ay Feb 22 pero that’s cutting too close. To be safe, dapat earlier than Feb 22. I scanned my passport and sobrang black nya huhu. Okay lang ba picture-an ko nalang ang passport ko? Tapos my 2×2 picture ako dito, scanned ko rin to sya di po ba? Pero after scanned, cropped ko nalang sya para hindi masyado malaki ang size? Panong sobrang black po? Pa-scan mo na lang ulit nang mas maayos. For photo, ang best po gawin is upload a digital copy of the image para clear. 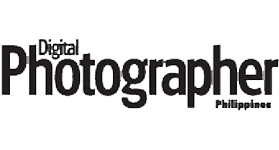 Go to a studio and have it professionally done tapos hingi ka ng soft copy (digital copy) nung image tapos yun ang upload mo. Applied today. Sana ma-approve yung application ko huhuhu. If she’s not booking the hotel here in India will she be allowed to travel ? I’m the resident of India and if I do refer her, still need to book hotel. If no them how to refer ? Will this be your friend’s first time to travel abroad? If she’s declaring she’s staying with someone, she might be asked to provide proof of relationship, invitation letter, and proof that the inviting person can afford to sponsor her. If she’s traveling as a tourist, she will need hotel booking and proof of employment and proof that she can afford to travel. Is there any minimum fund required in ur bank account after having visa and flight tickets? Will the immigration officer ask ur bank statement or e-visa portal asks of bank statement ? Is it mandatory to be employee ? If there’s is any minimum fund required then how much it Should be ? 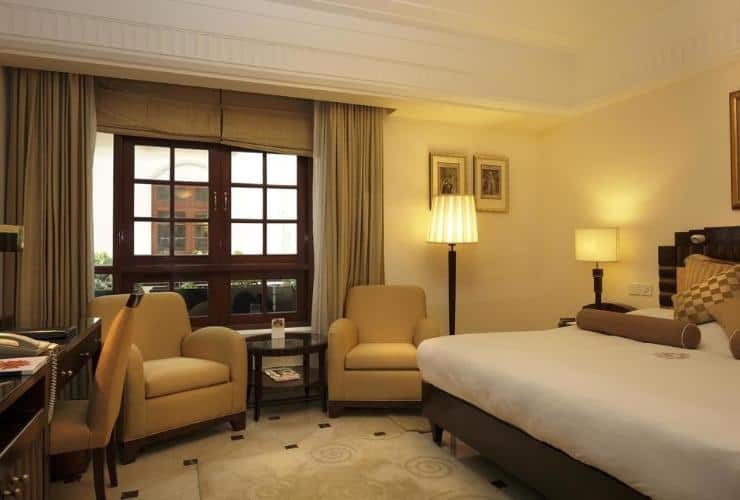 Can’t we book hotel after arriving in India? Approved na e-visa ko after 2 days from application date and will travel on February 27th. My destination is in Cochin. Will share my experience after my travel. Thanks Yoshke! 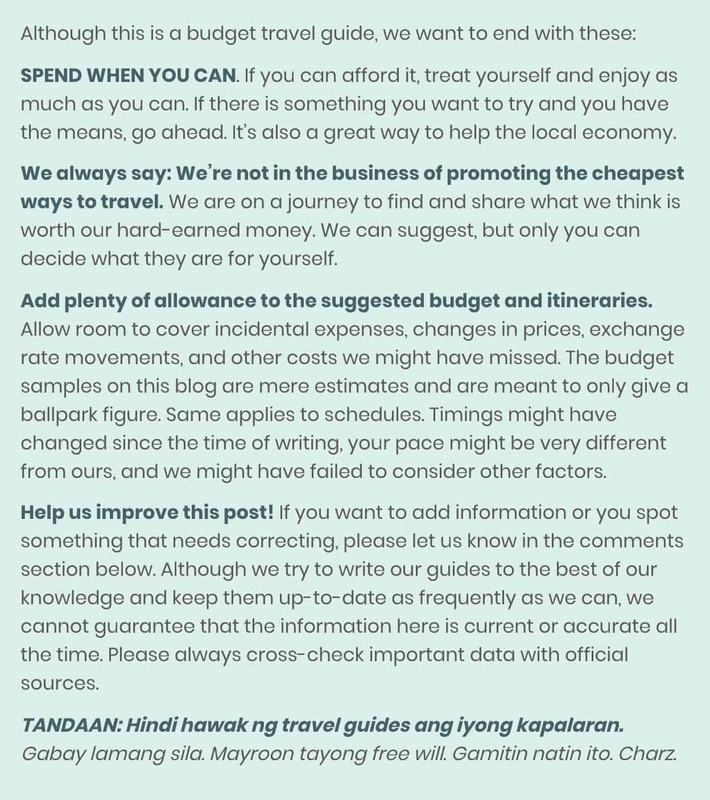 Super duper big help ang blog na ‘to. hello. I applied Business Visa for company training. I applied February 27, 2019 until now my application was still processing at the embassy as the agent replied my email. How is that possible? What do you mean “agent”? Did you hire a travel agent or are you referring to embassy staff? 1. Sa pag upload ng copy of passport , no need na ba to upload the pages where it show stamps? 2. Do I need to provide any bank certificate or such? 1. Just the bio page.